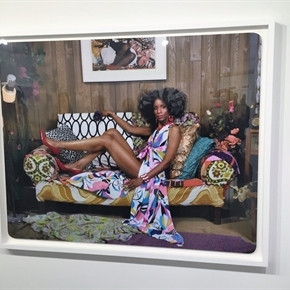 The 10th annual Dallas Art Fair kicked off with a preview benefit on April 12 in downtown Dallas at the Fashion Industry Gallery on Ross Avenue. The Art Fair ran through Sunday, April 15. Presented by Ruinart, the 2018 Art Fair showcased more than 90 top national and international gallerists. The works of art represented painting, sculpture, photography, works on paper, video and installation. Artists were both modern and contemporary. Kelly Cornell served as executive director, and Brandon Kennedy, director of exhibitor relations for the art fair. This year’s Art Fair signals the growth of the surrounding Dallas Arts District in cultural importance on an international scale. It was a philanthropic celebration of both international and contemporary art and local art institutions. The event benefitted the Dallas Museum of Art, Nasher Sculpture Center and Dallas Contemporary.